Back to School? But It’s Only the Fourth of July! Every year, it seems the kids are barely out of school and before you know it, the Back to School displays and sale signs are going up in stores. Back to School time is a great time of year to take advantage of sales and to stock up on clothes and supplies at a discount. And as any mom will tell you when the school supplies and sales appear, the unofficial countdown to the first day of school begins. The other event it signals is school registration time. This is the time when schools are busy tallying enrollment, studying class sizes, making classroom assignments, and fretting over the need for more space. Screenflex to the Rescue with Back to School Savings! When your school is tight on space, make use of the space you already have in the best way you can, by dividing it! Space for temporary classrooms can often be found in the most unusual places. Using Screenflex portable room dividers can save your facility thousands of dollars in remodeling costs or investments in mobile classrooms. Because our dividers are temporary walls, a lunchroom can be used to hold two kindergarten classes in the morning, easily store away for lunch at noon, and return to hold more classes in the afternoon. And because space is ALWAYS a concern in your facility, Screenflex dividers fold down with ease (A one-person job!) and store away compactly. Our largest unit collapses to a 3′ by 2′ footprint and can fit through a standard doorway. So if your school has found itself on the short end of space, take advantage of our free design service and send us a sketch of your space and needs. We’ll find you the most cost-effective ways to solve your problem because that’s what we do; solve your space problems… by dividing them! Back to School savings with Screenflex has made solutions more affordable, right when you need the space and the savings. 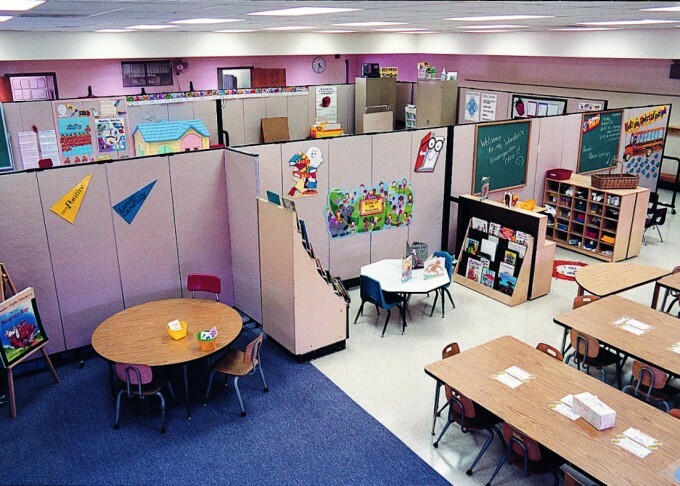 Just in time for back to school, call one of our customer service representatives at 800-553-0110 for a free space planning consultation, you’ll be glad you did! Does Class Size Affect Student Achievement?